Edgar Wright’s latest film The World’s End draws to a close a trilogy of some of the most entertaining, genre-hopping and innovative films that have graced cinemas in the past few years. Known as the ‘Cornetto’ trilogy, the films Shaun of the Dead, Hot Fuzz and now The World’s End have set the benchmark for British comedy films. Each has had a distinct genre, although there are common thematic threads woven throughout each instalment. 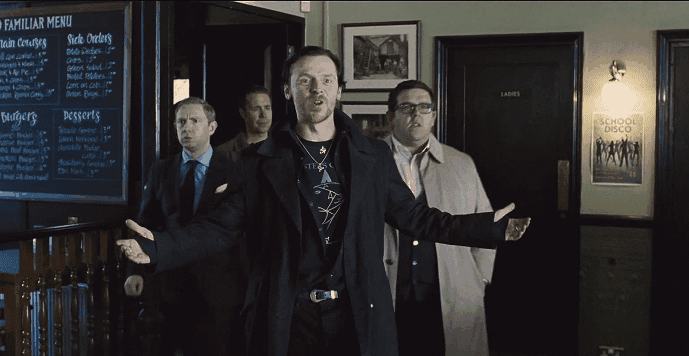 The World’s End is not only a hilariously witty science fiction tale but also a prime example of Edgar Wright’s accomplishment as both a storyteller and a director. 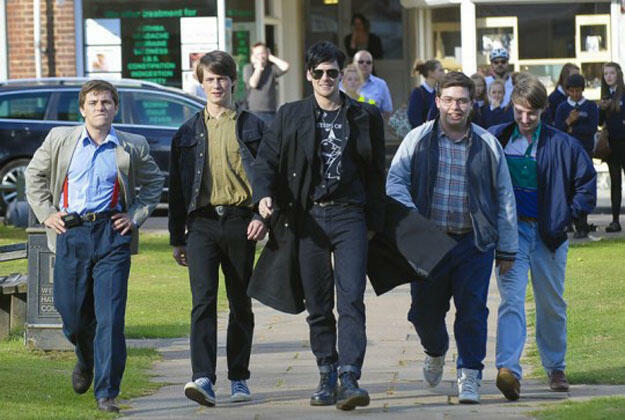 The World’s End finds five friends reuniting after twenty years or so to re-attempt an epic pub crawl they embarked upon shortly after leaving school. Led by rebel-without-a-cause Gary King (Simon Pegg) the group’s mission is to tackle the Golden Mile, a hefty twelve pub endeavour. 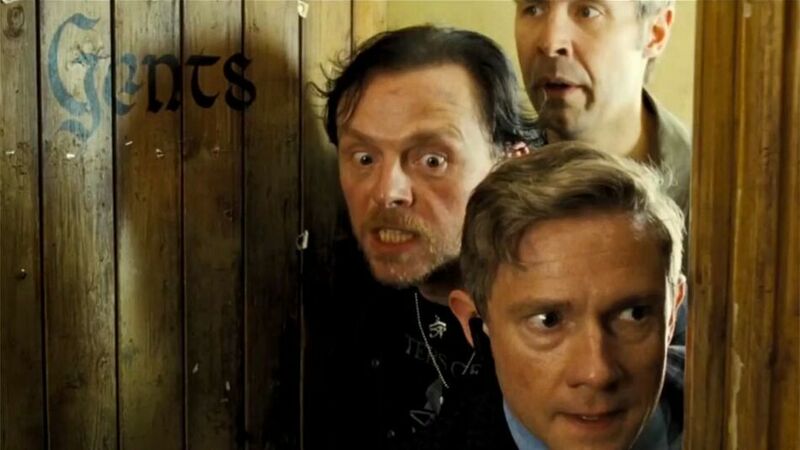 The otherwise reluctant band of binge drinkers is made up of Andrew (Nick Frost), Oliver (Martin Freeman), Peter (Eddie Marsan) and Steven (Paddy Considine). The group soon find that their home town has changed much more than they expected, resulting in a night out they’ll never forget. The success of this film comes from how well the characters are established. Within the opening moments we are introduced to all the lads and their back stories are told in a succinct and interesting way. A major strength of Edgar Wright’s films is that he takes time to let the audience invest in the protagonists before dropping them into crazy situations. For the most part this is done by way of excellent casting and a superb screenplay. The beauty of Pegg and Wright as writers is that they create scripts that somehow seem to evolve in tone as the film goes on and are wittily self-referential. The standout performance of the film is definitely Simon Pegg, who is forced to drop his usual nice-guy-slacker shtick. Pegg’s portrayal of Gary King, as a man who peaked at eighteen, is inspired. I think everyone knows a man like Gary King: a bloke who is always trying to relive the ‘good old days’, never wanting to grow up and thinking that fitting in with society is paramount to defeat. This is the perfect comedic anti-hero performance and Pegg’s natural charm is the major reason it works. Pegg is superbly supported as always by Nick Frost, who balances out his wild man antics. Eddie Marsan delivers one of the more touching moments of the film when he recounts some of his more traumatic high school experiences. However, it has to be said that it’s when the characters have several drinks under the belts that the performances become an utter joy to behold. They each make convincing drunks, which I like to think was due to plenty of practice in the pub together. As a director, Edgar Wright has always had a distinct style, encompassing quick cuts, pop culture references and large scale action set pieces. I found The World’s End to easily be his most polished effort to date, and that includes the super-glossy Scott Pilgrim vs. the World. In his earlier films, the quick cutting was used to cover up the smaller scale of the action set pieces, in a similar way to how Christopher Nolan shot the hand-to-hand combat in Batman Begins. The quick cutting implies that the action is fast paced and frantic, but if you look closely not a lot is actually happening. In the case of The World’s End, the quick-cut fight sequences have been refined somewhat and are incredibly well shot. The choreography was incredible, especially considering that these aren’t martial artists. I can’t wait to see what Edgar Wright can do when he directs the Ant-Man movie for Marvel Studios. Just as when these guys tackled the zombie and buddy cop genres, their take on science fiction is fantastic. It’s full of references to science fiction classics such as Blade Runner, Logan’s Run, The Day the Earth Stood Still, The Stepford Wives and Invasion of the Body Snatchers whilst being a compelling story in its own right. The World’s End is a hell of a good time that I encourage everyone to get out and watch. It saddens me that the trilogy is all wrapped up but hopefully the band will get back together one day. 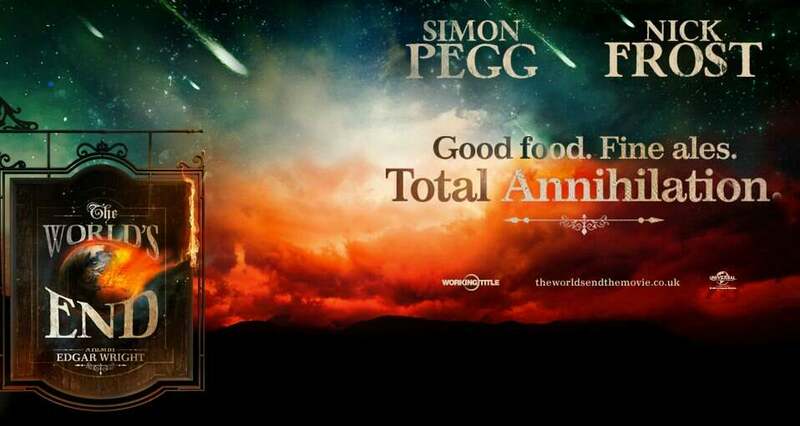 The World’s End hits cinemas on the 1st of August. If you agree or disagree with my thoughts feel free to drop me a line below. Nick Frost and Simon Pegg.